Gorgeous Green Cased Hand Painted Vase I believe this beautiful cased green hand painted vase was possibly produced by Fenton, although it is not marked. 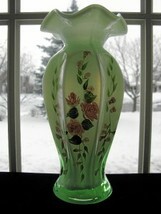 I have seen other vases by Fenton in this shape. A lovely decorative item for a springtime gift or for your own collection, this beautiful piece has eight panels and is hand painted with pink roses. The vase measures 9 1/4" high and 4 1/2" wide. The vase is in excellent condition, no chips, cracks or discolorations. TERMS OF SALE: Payment is required within 5 days of purchase. Payment by Money Order and Paypal accepted. CONDITION: All of the items sold are antique, vintage and are sold in used condition. I will describe all items as accurately as possible, however I do not mention normal wear or characteristics of old glass such as bubbles, wavy lines, straw marks, etc. unless they impact the appearance and/or use of the item. Since you may view this differently, please contact me with any questions. SHIPPING: All items are shipped via USPS Priority Mail with the exception of items that must be shipped in an over-size box or items that are extremely heavy. I usually use UPS ground for those items. Buyer pays actual shipping/insurance charges. RETURNS: All items are guaranteed as described. If you receive an item and believe that something was missed in the description or that the condition as described was not accurate, please notify me within 3 days of receipt. I promise to respond to you within 48 hours to insure a satisfactory resolution. If there is nothing wrong with the item and you just changed your mind, I will accept the return and issue a refund minus a nominal handling fee of 1.50. I do not reimburse return shipping fees. LOOKING FOR SOMETHING? 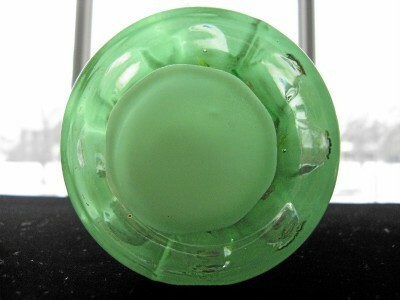 I have thousands of pieces of glass (Pattern Glass, Depression Glass, Elegant Glass, etc. and I may have an item that you are looking for. Please do not hesitate to contact me with an inquiry. All items are packed with the utmost care. I use quality packing materials, bubble wrap, packing peanuts, etc. A box large enough to accommodate the safe shipping of your item is used to insure that your item arrives in perfect condition.